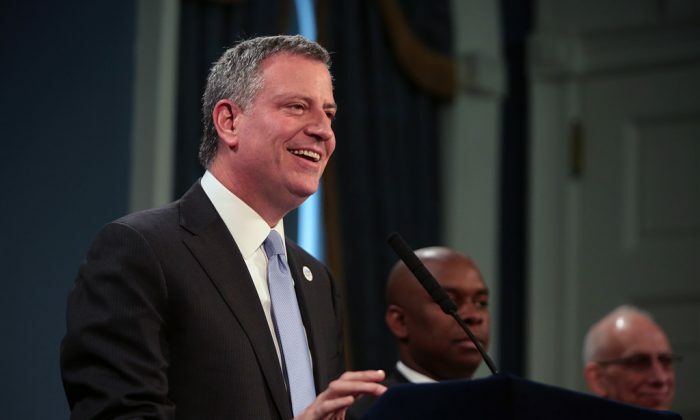 NEW YORK—Mayor Bill de Blasio released on Tuesday a more detailed plan of how to recruit enough teachers for his prekindergarten expansion. Though optimistic, the plan leaves questions unanswered, including the issue of quality. The city will need 1,000 more pre-K lead teachers this September, de Blasio said during a City Hall announcement, which included an 18-page report detailing the city’s recruitment efforts. The mayor said, “In any given year, over 2,000 applications come in from teachers who already have early childhood certification.” That suggests ample supply, as the state-issued certification is the hardest-to-achieve job requirement. Over the last month 459 properly certified teachers applied for the job with the city’s Education Department, an increase from 296 this time last year, according to the report. More teachers usually apply later in the school year, de Blasio said. Yet the report fails to mention where assistant teachers will come from, as a pre-K class is required to have one lead and one assistant teacher for a maximum of 18 students. A pre-K assistant teacher makes an average of $34,000 in New York City, according to job search website SimplyHired.com. Qualifications vary, but most job openings require at least an associate degree in childhood development or college credits in early childhood education, and one year of experience with child care. De Blasio has constantly emphasized pre-K needs to be of high quality to prepare students for their future education. He mentioned the quality nine times just during his Tuesday announcement. Yet the report doesn’t go into specifics about how the quality is to be achieved. All pre-K teachers should attend intensive professional development training this summer. It is not clear how long or how intensive the training should be, just that it will be administered by the Education Department. In addition, the Education Department has 45 coaches at the Early Childhood Education Instruction and Performance Team. They will be responsible for maintaining and improving the quality of the pre-K classrooms. Each of the coaches is responsible for 60 to 65 classrooms. De Blasio wants 30 to 35 more of them this September to cut the ratio down to one coach per 45 classrooms. It is not clear who those coaches are and what criteria are going to be used to hire new ones. In addition, up to 60 new social workers should be hired to focus on high-need areas. Also, not all pre-K teachers need to have the state certificate. Community organizations, such as the YMCA and the Children’s Aid Society, can also run pre-K classes. Yet their lead teachers don’t need to have the state certificate if they submit a plan to obtain the certificate in five years. The plan needs to be issued by an accredited college. Community organizations operate over 800 teaching sites in the city and should be held to the same standards as the Education Department’s pre-K. Yet their quality varies, according to Elizabeth Hartline, education director and special needs coordinator at Bank Street Head Start, a preschool program in Manhattan. School Chancellor Carmen Fariña said last month the pre-K expansion may, due to overcrowding at schools, depend more on community organizations. As community organizations operate on lower budgets than DOE schools, they pay teachers substantially less. The difference can be as much as $20,000, according to some job search websites. As such, teachers in community organizations tend to keep an eye out for the DOE jobs. “As soon as they get fully prepared, of course, they leave,” said Selena Lubell, Head Start director at the Child Development Support Corporation, which runs a few pre-K classes in the city. For that reason, many such organizations have trouble keeping good lead teachers. “We always have people who are at the bottom of the barrel,” Lubell said. Assistant teachers are more likely to stay, since they don’t have to get the certification. The report says the community organizations’ lead teachers with an early childhood certification will “earn a salary sufficient to attract and retain them.” But it is not clear how such an organization would achieve that. For example, the Children’s Aid Society funds each pre-K seat with $12,000 and offers teachers $41,000 per year, lagging behind the $50,000 salary of a DOE teacher with a master’s degree. The mayor’s plan offers less than $10,500 per pupil. Also, the Children’s Aid Society is a large, national nonprofit dating back more than 100 years. Most community organizations lack a resource base of such magnitude.